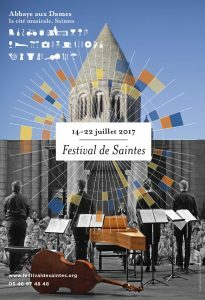 More than 45 years ago, Saintes witnessed a double rebirth: that of the Abbaye aux Dames and early music, with the music festival. A new generation of musicians emerged, including Philippe Herreweghe, and with them, a new mindset: more freedom in tone and creation, an original programme, a brand new friendliness in public relations. 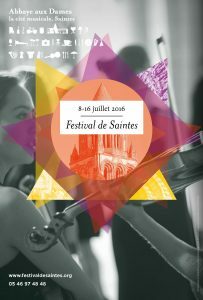 The Festival de Saintes breathed life into these singular traits, enabling them to flourish. Today, they are a hallmark. Excess aside, the atmosphere is intimate, and you can experience some 30 concerts, conferences, workshops and rehearsals. There are nine days and a thousand ways for you to enjoy the festival. While it is still dedicated to Bach, in 2018, the Festival de Saintes will cross the Channel to give voice to British ensembles and composers. You will discover England’s gloomy 17th century with the incomparable Lucile Richardot and the Correspondances ensemble, the cantata Handel composed in his youth, as well as his breathtaking “Water Music”, a bouquet of English tunes presented by Carolyn Sampson and the exceptional VOCES8, who will perform an exciting programme for you. Voices will be front and centre stage this year, with Lea Desandre, Deborah Cachet and the soloists of the ensembles Gli Angeli Genève, le Banquet Céleste, Vox Luminis, which will perform Bach’s cantata, and Graindelavoix and la Maîtrise from Radio France. There will also be some surprises in the form of an unreleased opera by Destouches, a nocturnal piano recital by Philip Glass, the interpretation of unknown composers who were contemporaries of Beethoven by the JOA and a piece by Thomas Dunford, accompanied by his new ensemble, who will open the festival with Vivaldi. 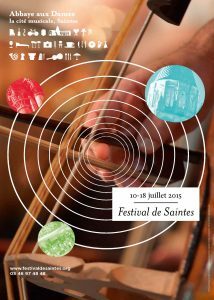 The Festival de Saintes has always had a soft spot for the music of Johann Sebastian Bach. The 2017 festival will be no exception, paying tribute to the Kantor with the grace of Vox Luminis, Gli Angeli and Benjamin Alard. However, this year will also be marked by composers who were practically his contemporaries and who have not been played much at the festival before: Vivaldi, Handel and Telemann. You will certainly recognise some of the artists featuring this year. You will meet many more, some very young, others with a long musical career. The festival is not limited to the concerts held in the abbey: concerts, conferences and public rehearsals will be held in atypical regional locations at 4.30 p.m. There will also be many activities for your children: go to their first concert with them, sign them up for singing classes for a week or have them contribute to the festival’s blog. 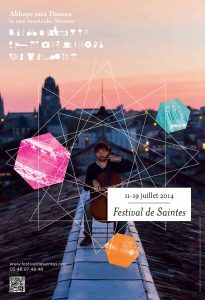 I hope that, from the very threshold of the Abbaye aux Dames, the aptly named cité musicale, you will be in the thrall of this 46th festival, a mosaic of intense musical moments. 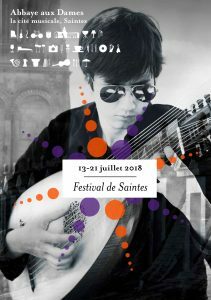 In 2016, the Festival de Saintes will be graced with a spirit of reunion, as Véronique Gens has not returned to Saintes since the “Leçons de Ténèbres” (“Lessons of Darkness”) held more than twenty years ago with Christophe Rousset. The Ensemble Mala Punica, international Ars subtilior champion, will return with a programme that has great significance for our times. A masterpiece, too, will make its comeback: Monteverdi’s “Vespers”, which have not been played at the festival in 30 years. La Tempête, a young, but already very distinguished, ensemble will have the honour of interpreting the masterpiece under the direction of Simon-Pierre Bestion. Françoise Rivalland, Marc Minkowski and the Intercontemporain and Graindelavoix ensembles will also be back for this year’s festival. Young musicians and ensembles such as Jean-Luc Ho, Camille Thomas, L’Achéron and the Masques and Cyclopes ensembles will perform in Saintes for the very first time. After a brief two-year absence, the Cappella Mediterranea, under the direction of Leonardo García Alarcón, will perform a pasticcio of melodies by Cavalli. 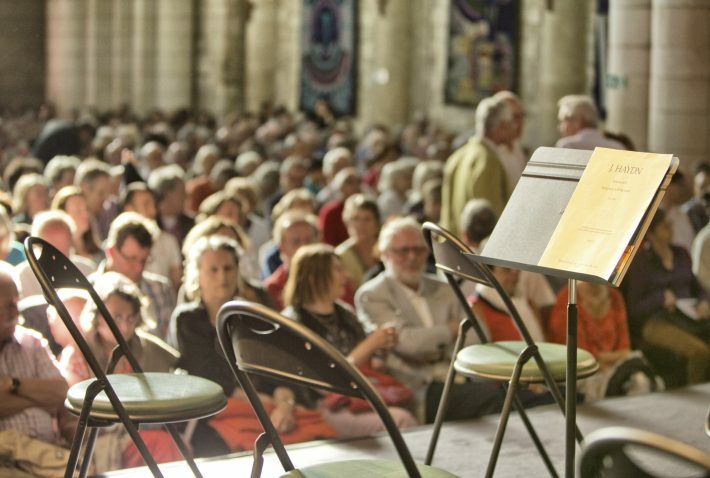 As Saintes has always been the perfect place for making discoveries or setting off on an adventure, the artists invited this year will honour composers you will not necessarily know. Borodin interpreted by clarinettist Raphaël Sévère, Erik Satie and John Cage by Alexeï Lubimov, Fux by Vox Luminis, Rossini’s marvellous “Petite Messe Solennelle” (“Little solemn mass”) by the Aedes ensemble, and, to wrap it up, Wagner and Strauss by Philippe Herreweghe. We will shine the spotlight on Maude Gratton’s first concerto, Jean Rondeau’s transcriptions for the violin and lute and recently formed ensembles that will tread the abbey floors for the very first time (Cambini, Gli Angeli, La Main Harmonique, Faenza, etc.). Finally, you must not miss the fabulous musical restitution of the splendour of Louis XIV’s wedding, performed by Sébastien Daucé, whose ensemble resided at Saintes before it became Correspondances. Vocal music will dominate Saintes this year. De Caelis will perform a vast spatio-temporal leap, from Hildegard von Bingen to Zad Moultaka. From the last hours of the Spanish Renaissance with Huelgas to the French tunes of the Great War sung by Isabelle Druet, all eras and forms will be represented. Céline Scheen will sing Barbara Strozzi. Leonardo García Alarcón will finally unveil his “Diluvio”. Hervé Niquet will return interpreting Couperin, and a pasticcio of Rameau’s operas will be performed by les Folies Françoises. Sonia Wieder-Atherton’s new, masterful take on Nina Simone.